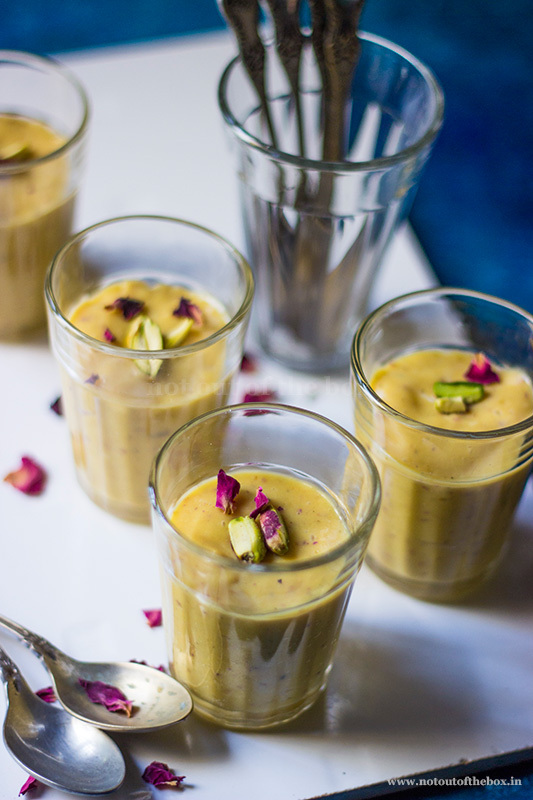 When I was thinking to make ‘Mango Pudding ’ a few days back, I was not very much convinced with the idea of making a conventional one, I wanted to introduce some new flavours to the regular mango pudding. But, at the same time, my thought was not to break the flavour coordination with some weird ingredients of course. I love to add dry edible rose petals into desserts for their gorgeous colour and subtle aroma. So, this time rather garnishing the dessert with them, I tried mixing the petals into the filling I was making for the pudding. 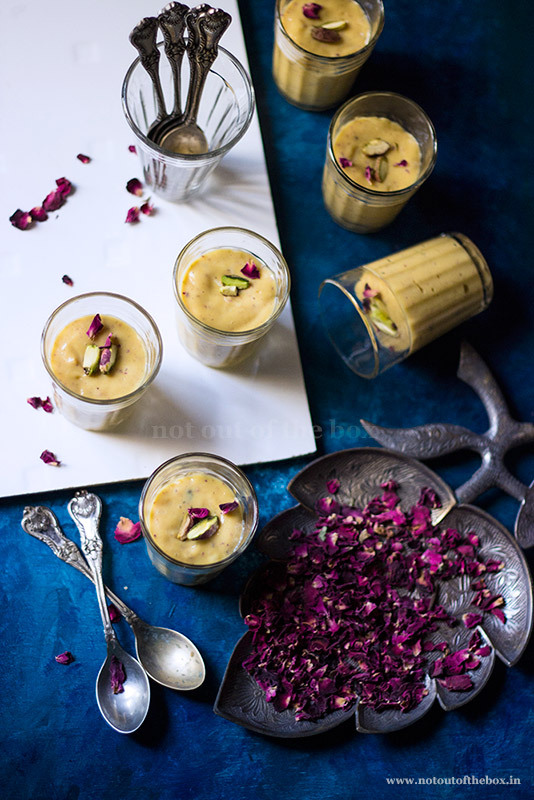 The end result was a rich, flavorful Rose Mango Pudding, and my guests did not stop praising me for making it, even they were blaming me that I should make some more so that they could get some more servings of it. 😛 How did I know that a new dessert experiment would be such a hit? I hope you’ll enjoy making it just the way I did. It’s a no cook, no bake Eggless Dessert, which kids can also try to make under their parental guidance. Here goes the recipe. Take a bowl; break the white chocolate into small pieces. Melt the chocolate using a double boiler (read note) or a microwave. The melted chocolate will be little warm, let it be cooled completely at room temperature before adding into the pudding mixture. Mix gelatin with water (the water I used was at room temperature), stir well to make a lump free mixture. Keep aside for 10 minutes. Peel and cut the mangoes into cubes. Add them into a food processor, pulse until smooth. 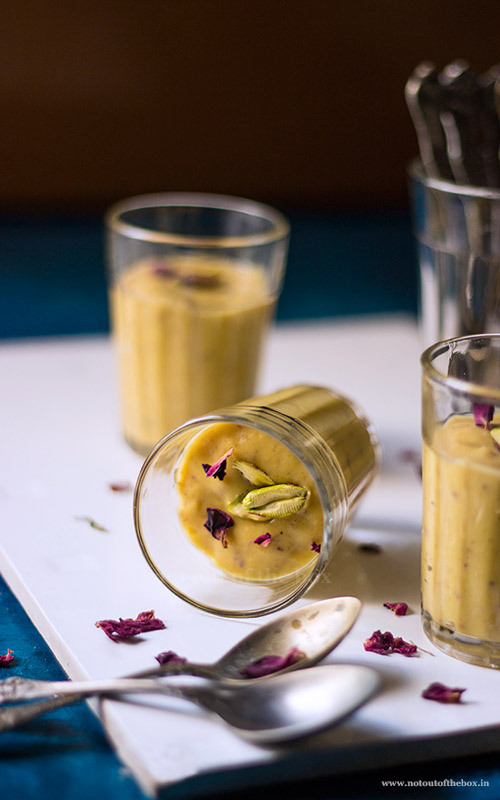 Now add rose petals, condensed milk, white chocolate, dissolved gelatin and cardamom powder, pulse until a smooth mixture forms. Divide this pudding mixture into serving bowls/ramekins. Garnish with sliced pistachios and rose petals. Wrap the top of the bowls/ramekins with cling film or aluminium foil. Refrigerate for 7-8 hours or overnight, the pudding will set within this time. Consume pudding within 2-3 days.